Top Shelf Productions, founded in 1997, was there early on to contribute to the rise of graphic novels in the United States with such trailblazing titles as Blankets by Craig Thompson and From Hell by Eddie Campbell. When you think of Top Shelf, you think of quality, style, and reliability. Top Shelf was started by Brett Warnock and Chris Staros. When Top Shelf joined IDW as an imprint, Staros stayed on and Warnock retired. Well, Mr. Warnock is back with Kitchen Table Magazine, a food and wellness magazine, that taps into his extensive background as a publisher and art director. To learn more, check out the Kickstarter campaign, active until December 26, 2018, in support of a subscription drive right here. KITCHEN TABLE MAGAZINE is a new print and digital publication that connects adventurous souls, curious cooks, and enthusiastic eaters with talented writers, artists, cartoonists, and photographers who explore not only the how-to’s of cooking, but the whys of eating. We’re at the trailhead of adventure, and would love to have you along every step of the way. We all eat. We all have our particular tastes and interests. Follow Kitchen Table to get a crisp, quirky, and unique perspective. Kitchen Table will share with you a lifelong passion, cultivated in the Pacific Northwest, to keep it fresh, sustainable, and just a little bit weird for good measure. Given Warnock’s special connection to comics, you’ll definitely find a good dose of illustrations here along with excellent writing, photography and design. Visit the Kickstarter campaign in support of a most welcome addition in helping you choose items related to food and overall wellness. You could spend a lifetime finding ways to improve yourself and the lives of your fellow humans. You can do it all by yourself, without the help of workshops or committees. But, when it comes to institutions (government, media, assorted nonprofits and such) it can end up being all the more challenging, and rather clumsy. So, now we have the venerable publication which has presided over countless households and subsequently found in countless yard sales, National Geographic, founded way back in 1888. No surprise here that something going that far back would have some skeletons in its closet–the number one of which is rampant racism. Today, in some of the what would seem to be the most progressive of neighborhoods, the racism has been dialed down to the most discrete of passive-aggressive levels. Oh, it’s there alright but it’s not talked about unless in some very pretentious public forum where everyone rolls up their sleeves to seriously tackle a subject they would rather not discuss. 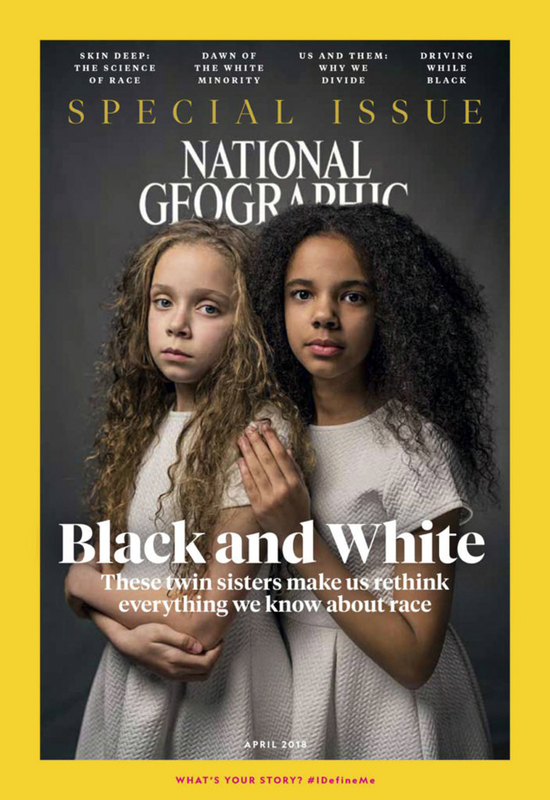 That said, the latest issue of National Geographic, with its biracial fraternal twins on the cover “daring” you to revisit the issue of race, is the perfect conversation starter for one of these particularly dowdy gatherings which all too often consists of white people who are at a loss as to how to engage with people outside their own race. These sort of gatherings take place all over the country. I’ve end up seeing for myself what they’re like in Seattle. They are well-intentioned, I guess. I came away with an overall feeling that people want to be heard and they want to come across as positive, intelligent, and “progressive.” But they are also prone to rationalizing their behavior as beyond their control, or even blaming The Other, that other group of races that seem beyond reach. Just consider the above remarks from one of these community outreach gatherings. 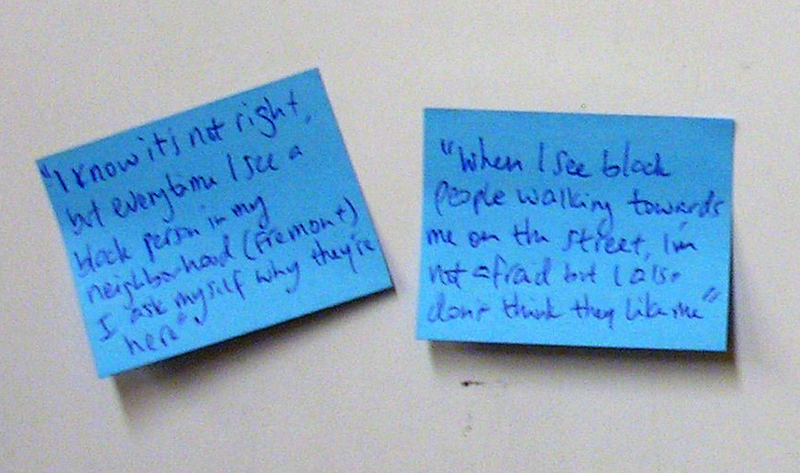 Feedback, like these typical remarks, was documented onto Post-It notes: “When I see black people walking towards me on the street, I’m not afraid but I also don’t think they like me.” And this one: “I know it’s not right, but every time I see a black person in my neighborhood (Fremont) I ask myself why they’re here.” Everyone earnestly discusses these sort of comments while also discussing an appropriate prop for the evening, in this case, “What Does It Mean to Be White? Developing White Racial Literacy” by Robin DiAngelo, an expert on, get this, Whiteness Studies. You can’t make this stuff up. National Geographic is world-famous for presenting The Other: decade upon decade of presenting people from other places, from other races, as exotic creatures. The cover of the April 2018 issue of National Geographic attempts to do good but, in fact, is right back to playing with The Other dynamic. Maybe this time any perceived bad is outweighed by any perceived good. In fact, there is a whole issue here devoted to confronting the issue of race and how the magazine has dealt with it over its long history. That is worth a lot of credit. Maybe I’ll check it out at my public library. Yeah, the library is another place I remember National Geographic from. I don’t know that this publication is truly resonating with Millennials or if it even matters. The magazine will know, I presume, when it’s time to just wrap it all up. For now, it is wrestling with its legacy–and that’s nice to see. National Geographic has a few irons in the fire. It’s on cable, right? I guess it’s one step forward and one step back–but they seem to be making an effort. Visit National Geographic right here. Kerry O’Quinn and Friends. 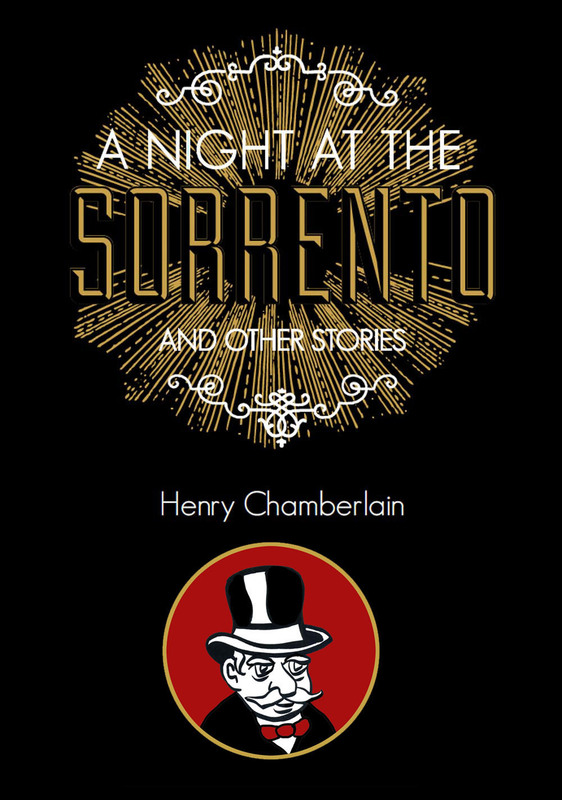 Illustration by Henry Chamberlain. Kerry O’Quinn is the co-creator and publisher of STARLOG, FANGORIA, CINEMAGIC, FUTURE LIFE, COMICS SCENE and more than a dozen other monthly newsstand magazines. Mr. O’Quinn is featured in an upcoming documentary on fandom, FROM THE BRIDGE, written and directed by Spencer F. Lee and hosted by George Takei. It was my pleasure to get a chance to interview Kerry. Here is someone who tapped into the world of fandom as if he were born to do so. O’Quinn and his partner Norman Jacobs got their start by creating and publishing a soap opera magazine in 1972. By 1976, they were ready to pursue publications aligned with their passions for genre cinema, television, and related pop culture. Starlog and Fangoria are the flagship publications from that golden era. 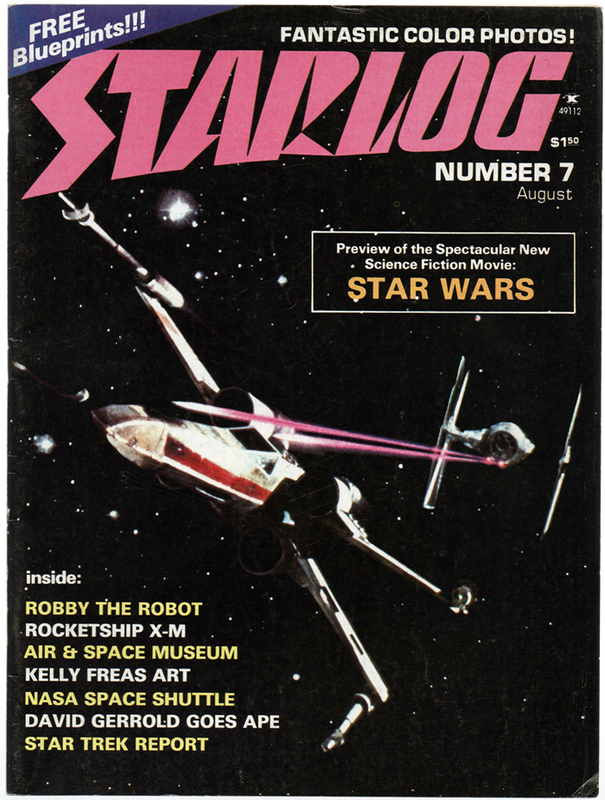 Starlog was launched in 1976. Fangoria was launched in 1979 and continues in its great tradition of covering the horror scene. These are the prime publications, along with Cinemagic, that would go on to influence thousands of creative people including many of the most celebrated talents working today like J.J. Abrams and Quentin Tarantino. Before the internet, you got your in depth information on the entertainment industry from magazines. One cannot stress enough how significant Starlog and Fangoria were in their heyday. Kerry O’Quinn would go on to celebrate the worlds of science fiction, horror, comic books, and fandom in various ways. Some of the most notable are his conventions that paid tribute to the 10th anniversary of Star Wars, the 20th anniversary of Star Trek, and the 20th anniversary of Starlog. 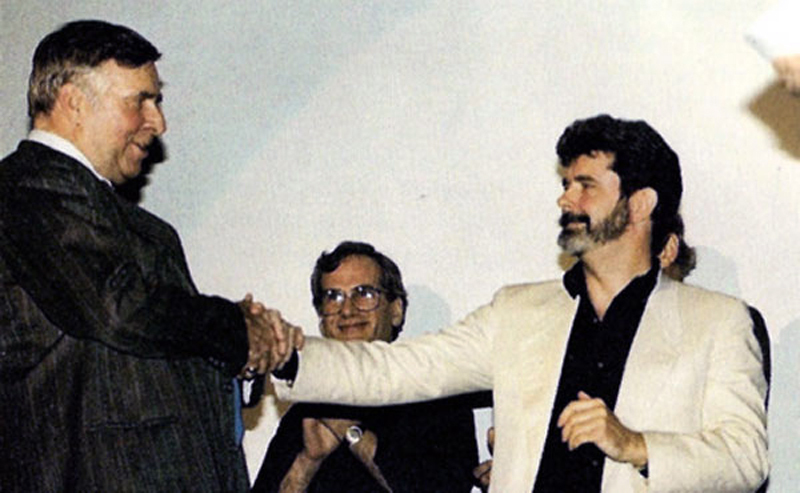 It was during the 10th anniversary celebration of Star Wars that Gene Roddenberry and George Lucas would share a stage for the first and only time together. How was such a marvelous feat accomplished? Well, Kerry O’Quinn was friends with both of these legends. It was Kerry O’Quinn who landed an exclusive in depth interview with George Lucas that was so comprehensive that it spanned three issues of Starlog. Over the years, Kerry O’Quinn has proven himself to be a man of many talents consistently exploring and creating new work. He has become an accomplished screenwriter with a number of projects including “Dragworms,” his unique take on zombies which is actually more character-driven than just blood and guts. What strikes me about Kerry O’Quinn is his energy and determination to pursue his dreams. I can relate to him on many levels. We’re both from Texas. We both love New York. We both juggle a number of passions: writing, drawing, acting, filmmaking. I think some people are just wired to need to do many things and will find ways to realize each goal over the course of a lifetime. That’s what is special about Kerry O’Quinn. That said, he’d be the first to say it is well within reach for everyone to follow their dreams. For more details on his remarkable life and his observations, check out his website here. HENRY CHAMBERLAIN: Kerry, I want to chat with you about fandom, and the upcoming documentary that you are featured in, “From the Bridge,” and cover as much as we can about your remarkable career. I want to begin by giving a shout out to your friend, Kurt Edward Larson. He conducted such a beautiful and heartfelt interview with you. KERRY O’QUINN: Kurt and I have known each other for a long time and have a lot of fun things in common. Kurt is such a Star Wars fan–and, when he got married several years ago, I wondered about what to get him–a toaster? a blender? No, what he would want was a day at Skywalker Ranch. I arranged that. He and his wife had lunch there and got a tour of the ranch. So, he was in heaven! I was talking to a buddy of mine about doing this interview and we got to speculating over the long lines for Star Wars on the very first day of release. We were just kids when it came out. I started to think about how Jaws had attracted long lines too a couple of years prior. From your special vantage point, Starlog was already on the scene having come out in 1976, would you share with us your take on the explosion of excitement over Star Wars in 1977? It was phenomenal timing. 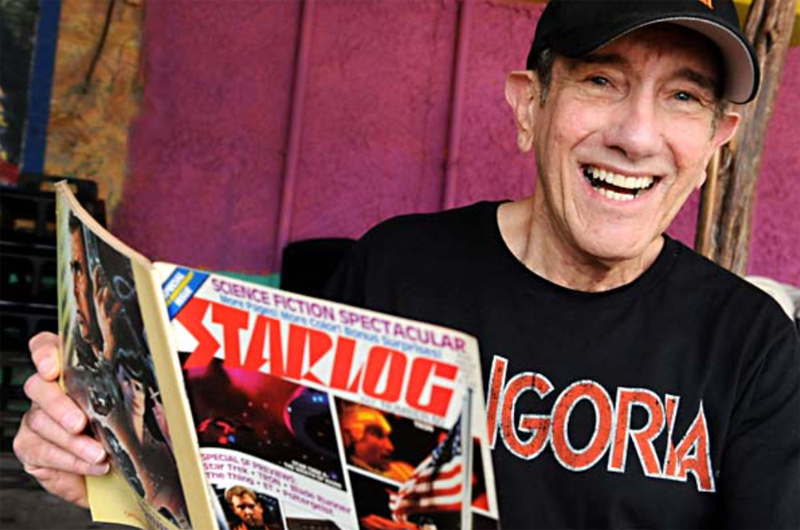 My partner, Norm Jacobs, and I had launched Starlog magazine in 1976, the Bicentennial year. At that time, there was no science fiction that was alive and happening. It was all stuff from the past that was being consumed. You know, stuff from the 1950s, the movies made by George Pal. Those movies were popular with nerds like me. But they weren’t going to win any Academy Awards or get any mainstream cheers of any kind. It was considered trash, like daytime soap operas. Horror movies, stuff like that, was not taken seriously. When we started the magazine, there wasn’t anything like it like there is today. And we had great difficulty starting the magazine for that reason. But, lo and behold, the very next year Star Wars came out. All of a sudden, it made the cover of Time magazine, with exactly the same X-wing cover that we had for Starlog. So, suddenly science fiction was at least getting noticed by a mainstream audience all over the world. It has gone on to become an important part of the culture in the same way that Star Trek has. And in the same way that horror and superheroes have. It’s very trendy today to be a nerd. It wasn’t 40 years ago. I remember when I first met George Lucas. He was telling me about having lunch one day at Hamburger Hamlet on Hollywood Boulevard. And it was right across the street from Mann’s Chinese Theatre. He said that he looked across and he saw lines of people. He asked what was going on. And a friend told him that it was his movie that was playing. It didn’t occur to George that huge lines were gathering along the sidewalk for his movie. He was delightfully surprised by the enormous fan reaction to his movie as all the rest of us were. It was when Star Wars lit up the sky like it did that Starlog went from a quarterly to a monthly magazine. Indeed, we were already there. Starlog was the voice of science fiction. 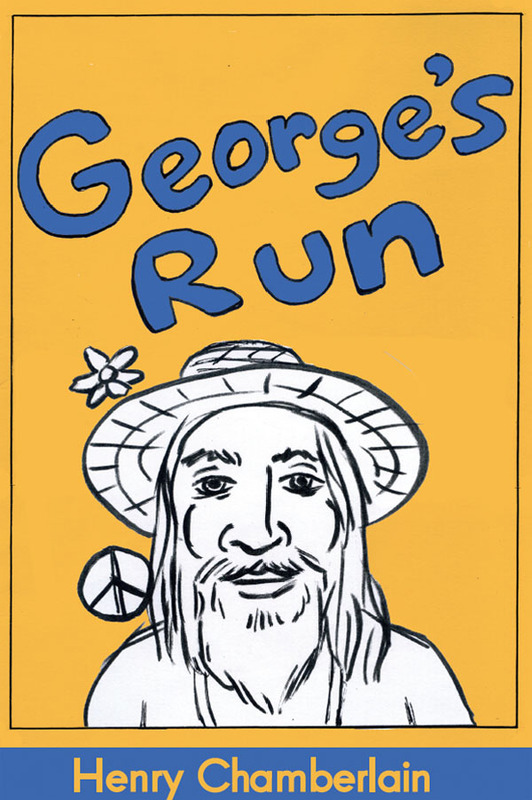 And George launched the science fiction that is very much alive and booming today. That scene with the long lines, that’s in your interview with George Lucas. For our Star Wars fifth anniversary issue, I had called to arrange an interview with George Lucas. He had turned down all the big magazines. I was told that he wasn’t doing any interviews but I begged and pleaded. George agreed. I flew out from New York to visit him. This was before he had build Skywalker Ranch. I did an lengthy interview with him in which he told me all kinds of wonderful tales. We were very comfortable talking with each other. We had many of the same values and things that excited us. We talked about everything from space to technology to classic cars. We talked for hours at that first interview. In fact, it turned out to be too much for one issue so I turned into three consecutive parts spanning three issues of Starlog. I believe it is the longest interview anyone has ever done with George Lucas. Share with us your insights on how Star Trek became a phenomena, after having struggled in the ratings when it was originally broadcast. It did indeed struggle. In fact, after the first two years, NBC had cancelled the series. And an amazing lady by the name of Bjo Trimble and her husband, John, did something that, at the time, was phenomenal. This was back in the mid-’60s. They organized a letter writing campaign to NBC by fans that generated more than a million letters. A TV network had never received that kind of reaction to the cancellation of a show–and they were stunned by it. Don’t forget that this is before the internet. Fans contacted each other back then with mimeographed newsletters mailed to each other. 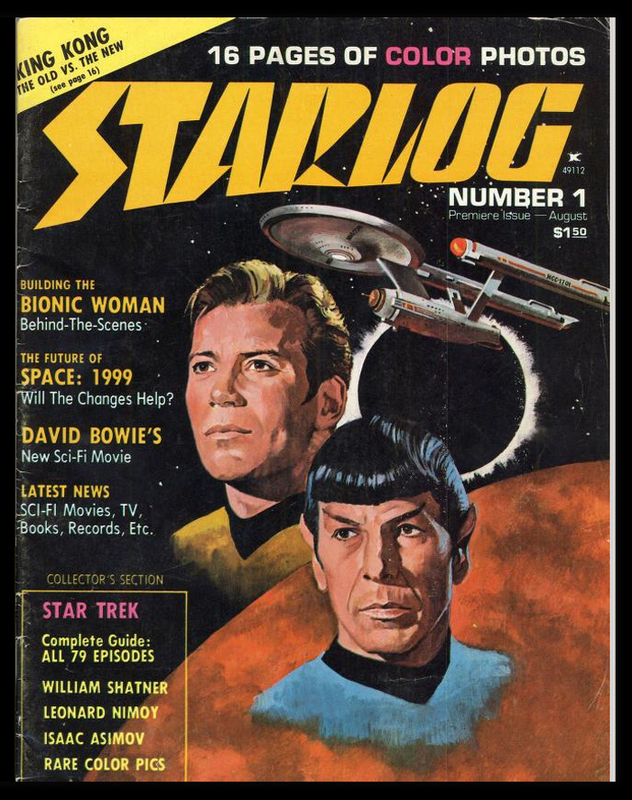 And then, ten years after the first broadcast of Star Trek, there was Starlog maganzine and fans could communicate with each other through our letters forum–as well as at conventions. Bjo had gotten a television network to renew a cancelled series. That had never happened before. What Bjo did was allow for a third season of Star Trek. However, NBC scheduled it on Friday nights, which is a dead zone for shows. So, NBC cancelled it for the second time. Everybody seemed to think science fiction was dead. But it was very much alive within this hidden fan culture. And the documentary that my friend, Spencer, is putting together covers how this fan base has grown in the last 40 years. It went from this invisible, almost ashamed, audience to what it has become today when you have 150,000 people show up at Comic-Con in San Diego each year in July. And the biggest movies today are superhero, science fiction, and horror, everything that our magazines were all about. Star Trek is right at the root of that response, at the heart of it. Gene Roddenberry created a concept of the future that was positive and inspiring: rationality, science, and the better values of human nature would prevail. Star Trek not only inspired the original audience that tuned in for its three-year run. In syndication, Star Trek reached around the world with its universal concept that the human race can be better. Gene deserves everybody’s praise as Star Trek is one of the most inspiring things to be created in any genre. Sometimes science fiction warns us of things that we need to be careful about. And sometimes science fiction shows us that things are within our control, we can make it better, and gives us hope for the future. I’m thinking of how Star Trek was ahead of its time and so it made sense that it would struggle in the ratings. The same is true for The Twilight Zone. Both of these shows have a lot in common. The primary thing is that they both have subtext. There was social commentary in the guise of fantasy and science fiction, very much ahead of its time–now, we take that for granted, don’t we? We do but we still need it since we don’t have a lot of it. Even with the science fiction that we have today, with all the dazzling special effects that we didn’t have back in the ’60s. Visually, science fiction today is dazzling, uncontrollable, and amazing. Back then, the effects were kind of clunky, rubber monsters and the like, but nobody cared because–and this is certainly true about The Twilight Zone–the story talked about the issues, important values, and principles. Science fiction does not show us the day-to-day reality but something that may exist in the future, something that could and that ought to exist. That is the noblest undertaking of art and science fiction is the best at doing that. 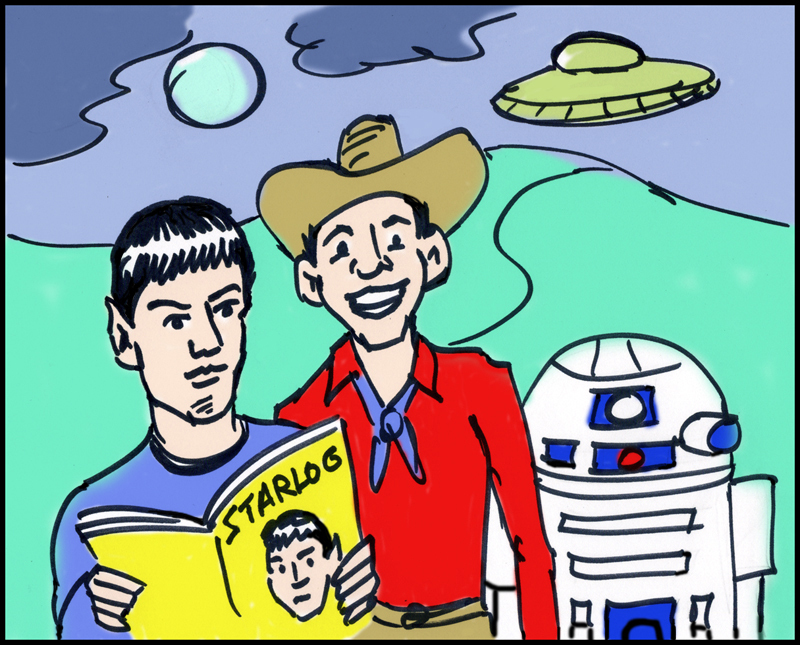 Rod Serling and Gene Roddenberry are hugely important and we featured them in the early issues of Starlog. At that time, there wasn’t any science fiction, like we know today, so for the first few years most of the content in Starlog was looking at things from the past in terms of movies and television. You were commenting on the past but then, at some point, you were not only commenting but you were part of the industry. There’s the whole how-to aspect from Cinemagic. There was quite the evolution as you became part of the scene. Exactly. When we began Starlog, we included everything even those things that were very loosely considered science fiction. And that included horror, and articles on special effects, and Hollywood technology workshops, all the way to NASA and the space program. As we evolved, we discovered that we had many different audiences reading our magazine. Some of these people wanted to be filmmakers. They wanted to make these movies that they loved. 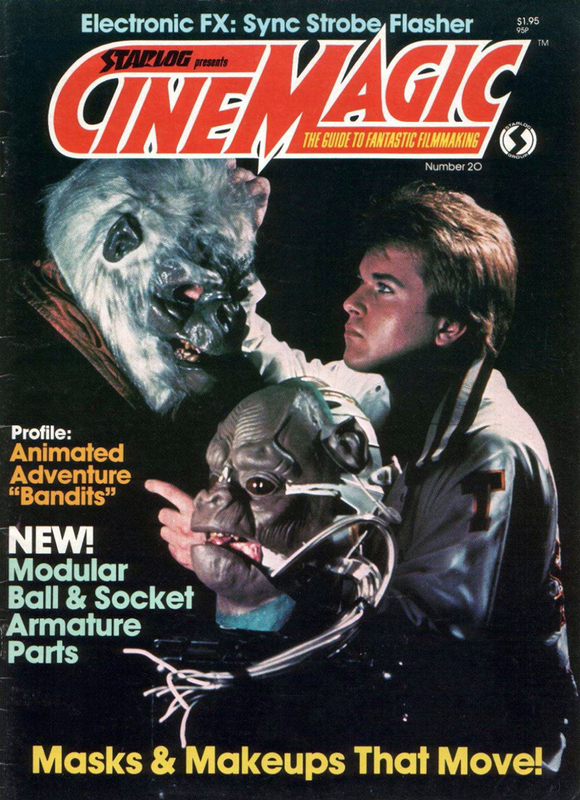 Therefore, we branched off and created the magazine, Cinemagic which taught young filmmakers the techniques of production and special effects. We had a short film contest each year. We gave out prizes and trophies at a big theater in New York with celebrities to present awards. Some of these award winners are working in Hollywood today. A lot of folks, like J.J. Abrams and Robert Rodriguez were inspired by Cinemagic. Steven Spielberg, at one time, said that Cinemagic was his favorite magazine, the only magazine promoting the future of the film industry to young people who were unsure if they could recreate the amazing things that they adored on the screen. I was curious about the overlap between Fangoria and Famous Monsters of Filmland. There does not seem to have been a rivalry between you and Forry Ackerman. Famous Monsters began in 1958. 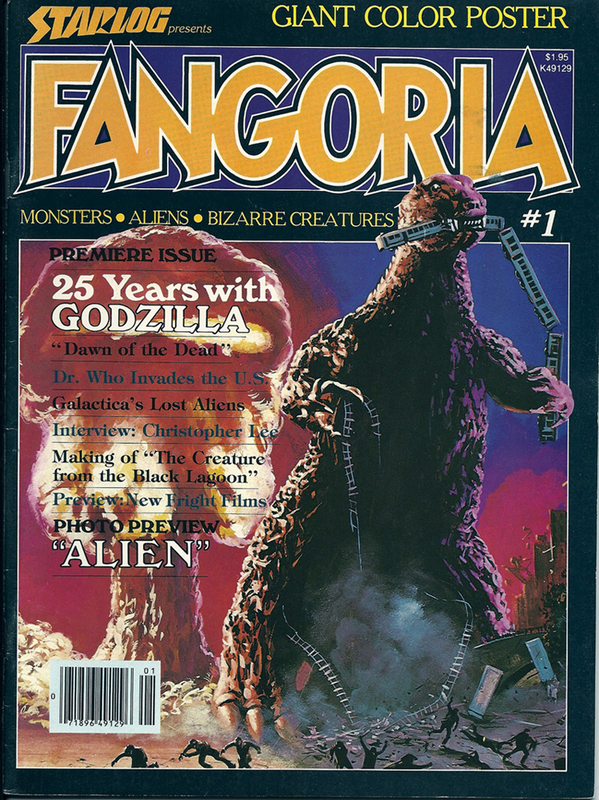 Fangoria began in 1979. You have Forrest J Ackerman, the founder and editor of Famous Monsters, in your film, “Fangoria’s Weekend of Horrors,” which I must say is an outstanding documentary on fandom in its own right. 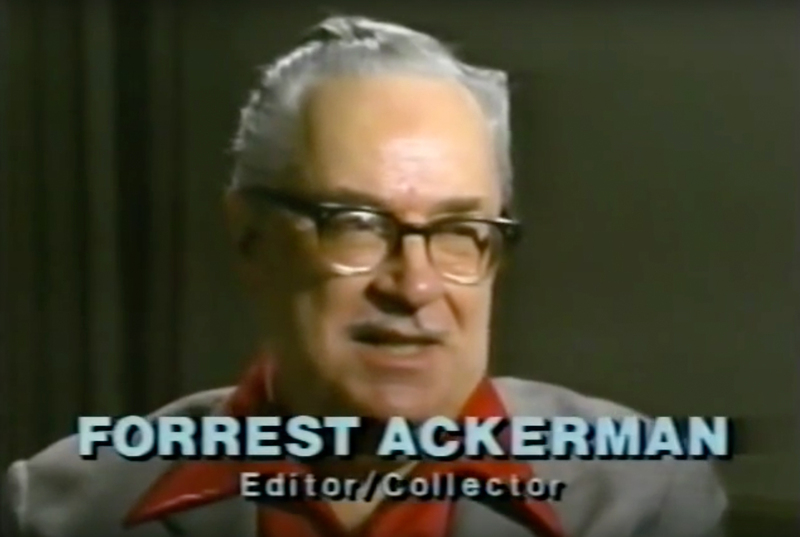 What can you tell us about Forrest J Ackerman? What did you learn from him? He was obviously the precursor to all of our magazines. 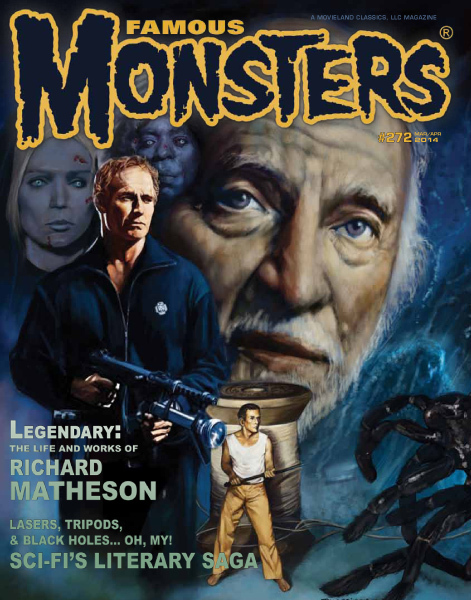 He did something very daring in his day: to do a magazine about monsters! What kind of freaks are interested in something like that? Well, it turned out that there was quite a few. Again, these people were all in the closet, so to speak. They bought the magazine but they didn’t have any social status whatsoever. They were outcasts. They were unusual. That was me. That was a lot of people. Our magazine brought people out of the closet. I met Forry many years ago, at a convention, and immediately we had a lot in common. We became friends and we remained friends, it makes me sad to talk about it…I was with him just a few days before he died. He was still in good spirits and still telling me jokes. Forry was such an important person in my world and he became a very dear friend. 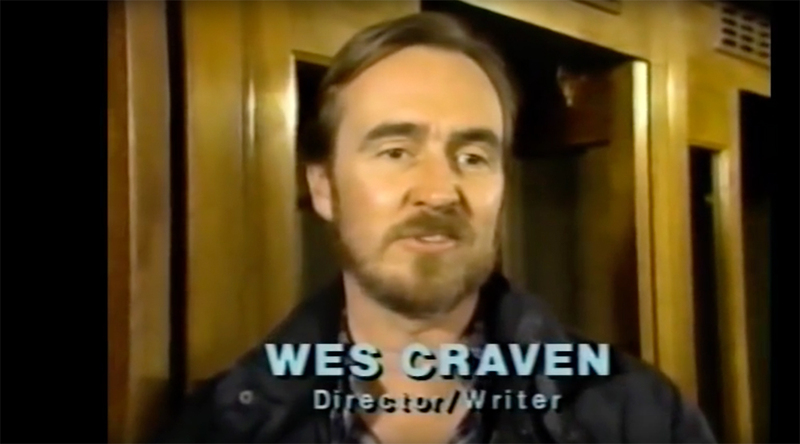 I actually went over to his old home out here in L.A. years ago, which was called the Ackermansion. And it was a museum of props and artwork and all kinds of things that he collected from these strange movies that no one gave enough credit to but that he knew that it was an important part of the culture that should be saved and preserved. And there still is no permanent museum for that sort of thing. And I’m hoping that, in the near future, there will finally be a museum that recognizes and preserves science fiction, horror, superheroes, fantasy, all of the films that are now way out of the closet–and a part of mainstream culture, not just in the U.S. but world-wide. Kerry, there are so many things we can talk about. Ayn Rand. Cannabis. More about Star Wars. There’s your book on how to chase stars, chase your dreams. Yes, “Reach For The Stars.” It’s a book that has a lot of practical advice on how to make your distant dreams come true. I also have to touch on your project with HBO which may still find its way back to them. It’s a Twilight Zone type of show called, “Future Tales.” Boy, that would be some show! Me too. Who isn’t interested in tomorrow? Exactly! You know, Kerry, I’m over the moon. We share so many connections. I’m a cartoonist. Yes, and I love New York. And I can see your early interest in cartooning probably having to do with being able to control the whole production and allowing your vision to run free. That also carried over into animation. In New York, years ago, I was so impressed with Disney and his multiplane animation that created three-dimensional pictures. I got a bunch of plumbing pipes and I built my own multiplane animation stand in my apartment in New York. At the time, my dream was to create a little film that was so damn good that I’d send it out to Disney and he’d have me come out to work for him. That was my dream: to work for Walt Disney! Now, it never did happen and I clearly changed my mind since then but I did produce a few short films on that animation stand. I still love animation, and illustration–that was my original career. I’ve done so many things since then that I have a resume that looks like I’m schizophrenic. Well, I wish you and Spencer the very best with “From the Bridge.” I’m excited about it and I’m sure it will find a wide audience. It’s going to be very popular with the fan community–because it’s all about them. And the power that they have grown to hold in the last few decades. I interviewed George Clayton Johnson a number of times–a science fiction writer and big supporter of fans–and he always brought up people power. In the end, it is the fans who matter the most. Absolutely. I’m going to do a panel at Stan Lee’s Comikaze Expo (newly renamed Stan Lee’s Los Angeles Comic Con) here in L.A. next month with Bjo and John Trimble and my friend, Tom DeSanto, who produced X-Men and Transformers, and we’re going to talk about fandom. That’s what it’s all about. Well, very beautiful. Thank you so much, Kerry. You’re very welcome, Henry. I always enjoy talking about what I enjoy most of all. Check in with Kerry O’Quinn at his website here. If you are in Los Angeles on October 28-30, come see Kerry and enjoy some pop culture fun at Stan Lee’s Los Angeles Comic Con. You can find details on that right here. Don Martin. We know his uniquely surreal and eccentric cartoons from MAD Magazine. Who better to shed light on Don Martin, and the world of MAD, than longtime MAD editors Nick Meglin and John Ficarra. Mr. Meglin goes back to the early years of MAD. He retired in 2004 but remains a contributing editor. Mr. Ficarra was brought on board by Mr. Meglin and the two worked together for many years. Both men are quick with a joke and just a pleasure to talk to. The subject for this interview is the uproariously funny work of Don Martin and “MAD’s Greatest Artists: Don Martin: Three Decades of His Greatest Works,” a 272-page hardcover published by Running Press and available as of November 11.
fiction, Richard Matheson. Yes, he’s the guy who wrote that famous episode of The Twilight Zone with William Shatner freaking out at seeing a gremlin on the wing of the plane he’s on, “Nightmare at 20,000 Feet.” He was a prolific writer and wrote one of my favorites, BID TIME RETURN, which became the movie, SOMEWHERE IN TIME, starring Christopher Reeve. 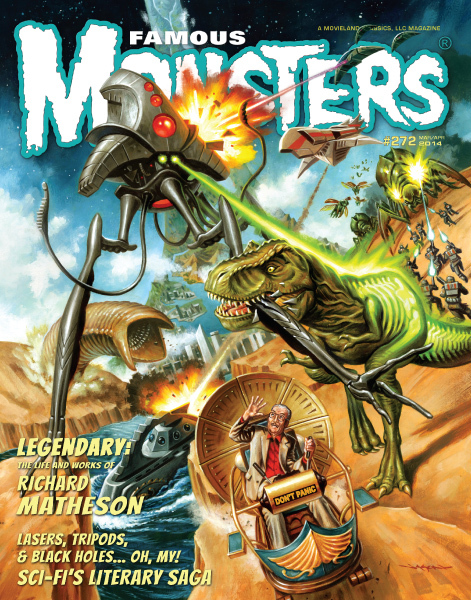 Visit our friends at Famous Monsters here. The holiday season is upon us and what better way to rebel than with the right dose of sarcasm and wit? Well then, look no further than the latest issue of the quarterly humor magazine, The Devastator. 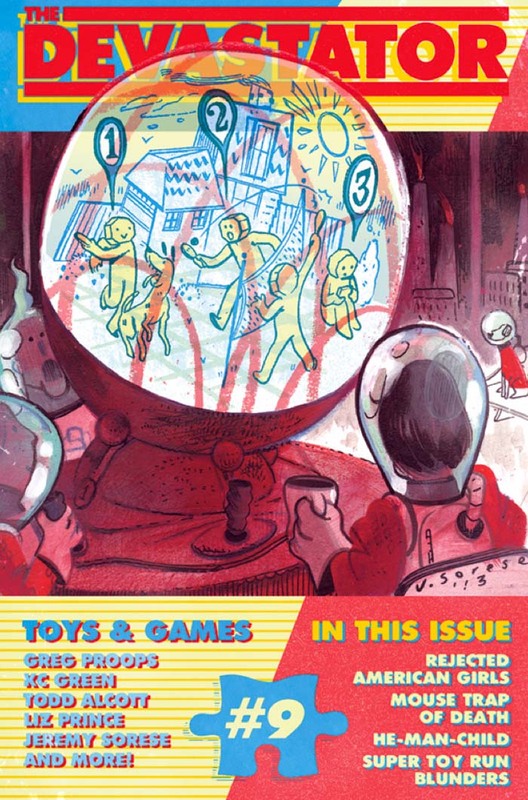 Issue 9 is devoted to the theme, Toys & Games! Ah, what fun! Get it here. 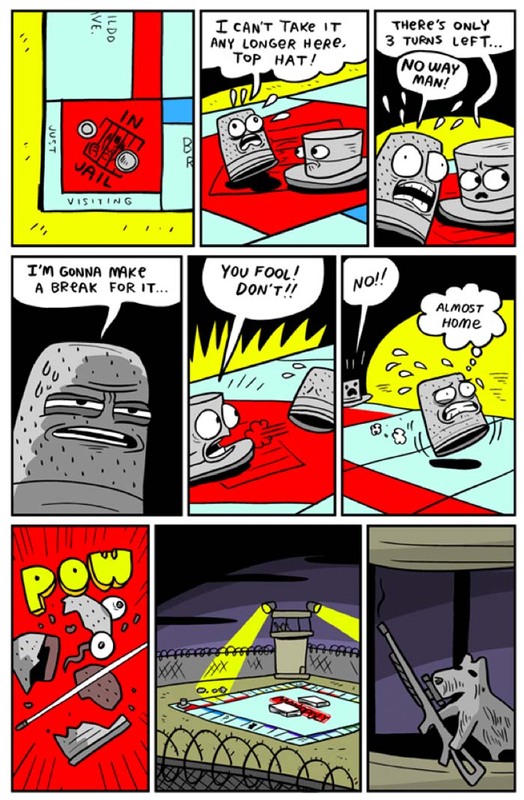 In an issue chock full of comics, prose, and all sorts of jolly manipulation of other content, you start out with the one-page comic, “In Jail,” by K.C. Green, that sets the tone for funny. “Mastermind,” spoofs the beloved board game and is brought to you by Comedian Greg Proops (The Smartest Man In World, Whose Line Is it Anyway? 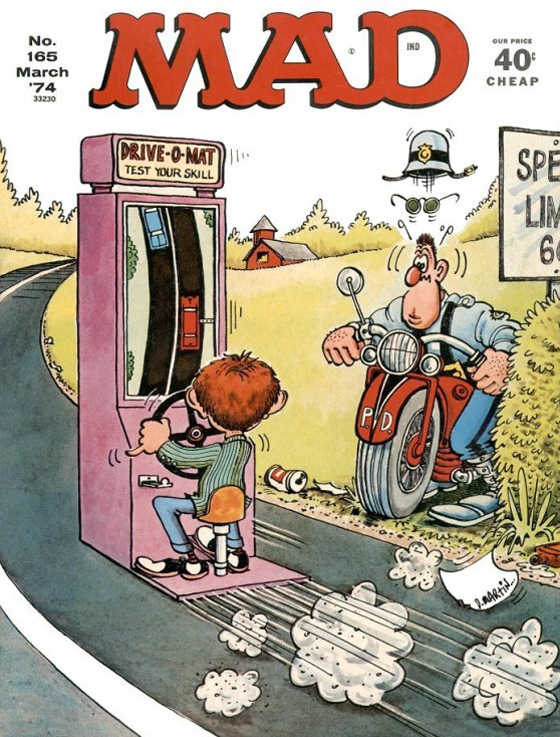 ), well in the tradition of hilarious photo-comics from The National Lampoon. 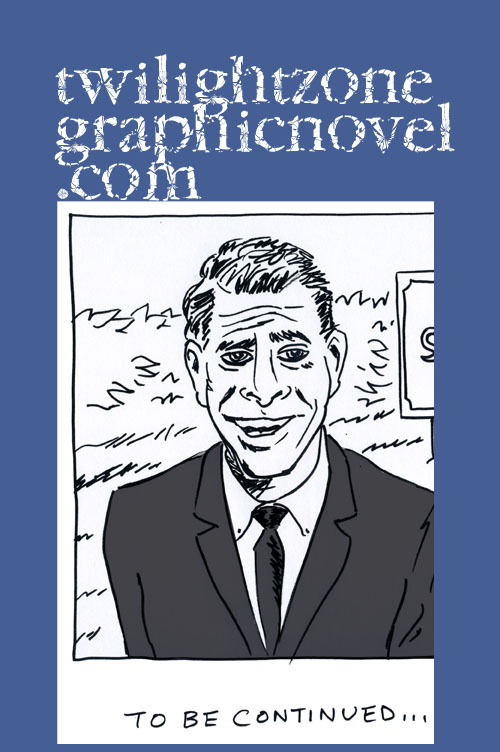 Or perhaps your refined taste for offbeat humor runs toward more complex satire? No problem there, sport. You will be thrilled by such involved work as “Bye-Bye, Miss American Girl,” by Patrick Baker, with art by Grace Levine. There’s even a fully formed new board game, “ClueMates: The Passive Agressive Roommate Detective Game,” illustrated by BOOM! Studio’s Yehudi Mercado (Adventure Time comics, Pantalones, TX). 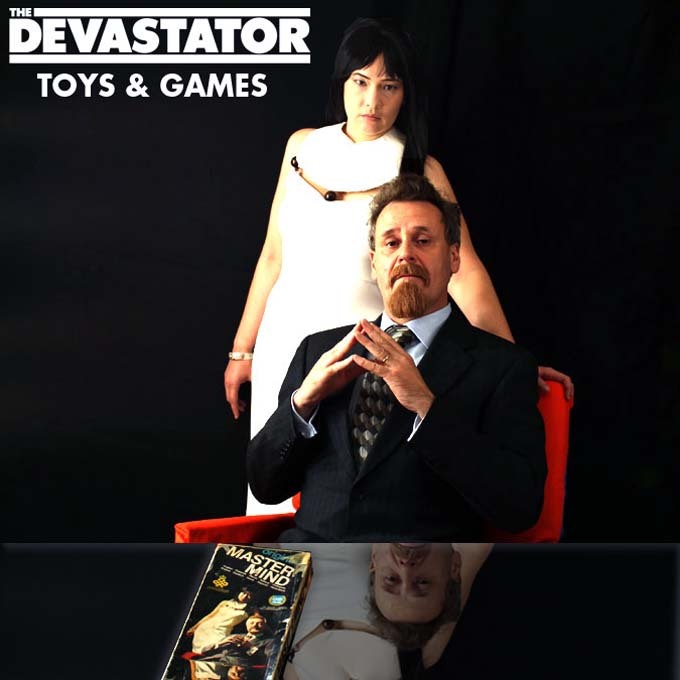 The Devastator is a Los Angeles comedy magazine, founded by writers Geoffrey Golden and Amanda Meadows. Each issue features original comics and writing by some of the funniest people alive: from The Daily Show, The Onion, Adult Swim, Marvel, DC Comics, and more! Check out devastatorquarterly.com. 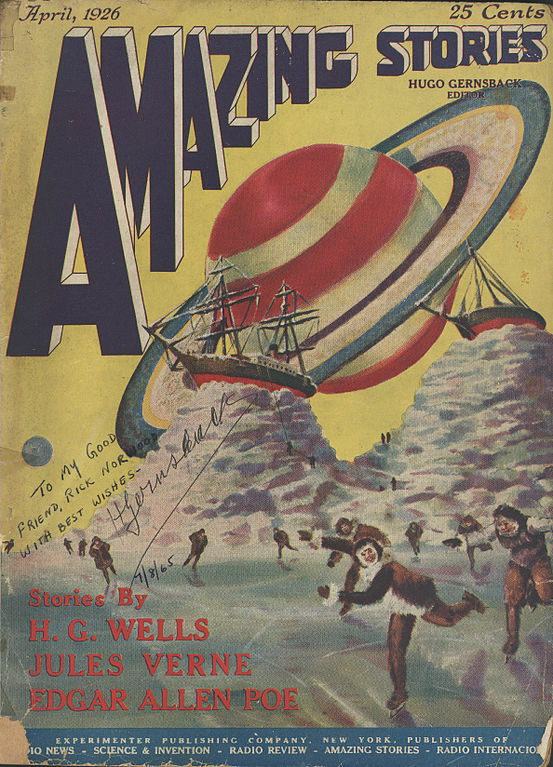 In some respects, the idea of “Amazing Stories” is more engaging than the actual publication. But that would be just looking at things too harshly, wouldn’t it? We are talking about science fiction and that requires a special sort of suspension of disbelief. It can be of the most sophisticated kind, mind you, since quality science fiction can hold its own with any literary form. “Amazing Stories,” with its strange cover art, was fated to be a strange creature. While the publication had a history of uneven and inconsistent quality, such is human nature. It was a grand experiment and, through the years, it would reach its potential splendidly. Launched in April of 1926 by Hugo Gernsback’s Experimenter Publishing, it sought to combine entertainment with education. Sales fell short of expectations, and within a couple of years, the magazine was set on its checkered path going from one publisher to another. But it would see the greats of science fiction grace its pages, it had the distinction of being the first magazine of its kind, and it helped pave the way for what was to come in the brave new world of sci-fi. As a lasting testament to its pioneer publisher, the prestigous Hugo Awards carry his name and carry on the promise of a unique literary genre. 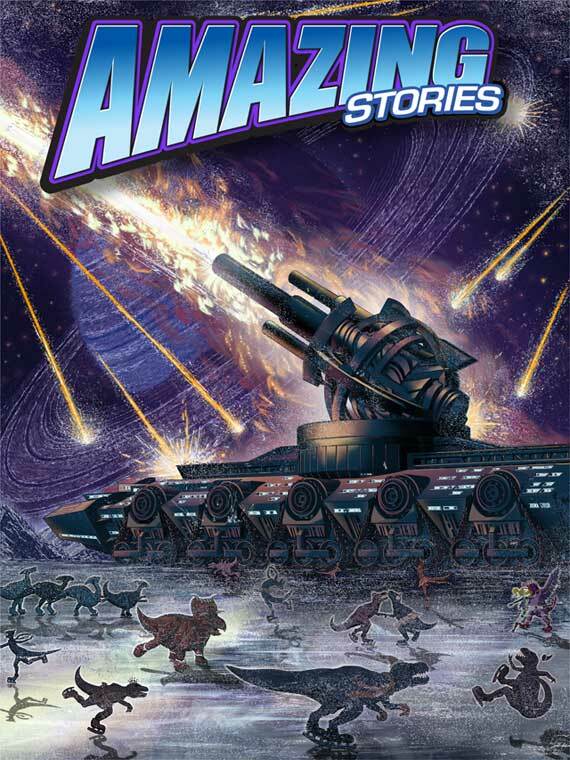 Comics Grinder salutes the return of “Amazing Stories” after an uncertain future. Steve Davidson has stepped in as the new publisher after the last publisher, Hasbro, allowed the trademarks to lapse. You can keep up with “Amazing Stories” at its blog. You will find there a most beautiful cover for the new issue by Frank Wu. This is his homage to the magazine’s original artist, Frank R. Paul.